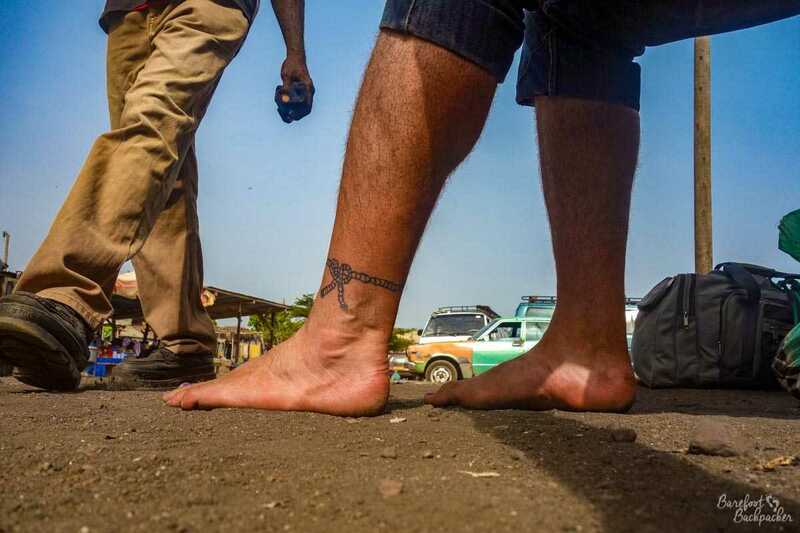 Barefoot and bagless, lost at an international border with just my passport and some money; I must have been a bit of a weird sight, wandering around aimlessly with no apparent motive or plan. I’d picked up a shared taxi in Grand Popo to take me to the border between Benin and Togo. My original plan had been to then pick up a minibus/tro-tro from the other side of the border into Lome. Close to the border, the driver had asked me where I wanted to be dropped off and where I was going to next; it turns out he was going to Lome too. I enquired about the price and it was reasonable, so I thought I might as well stay with him. The only other occupant of the vehicle was an older lady, also travelling into Togo. Obligatory foot photo, taken waiting for cross-border transport in Togo; although not taken at the border, I was barefoot for most of the country and the roads looked the same. We arrived at the Benin side of the border, so I hopped out to security/passport control – a large white shed, with an open frontage where two rows of wooden seats faced a panel of border personnel. There were only a couple of people waiting so I was soon processed, with the usual questions about where I was coming from, where I was going, and a reminded that my visa was only single-entry so I couldn’t return without a new one. After assuring the guard that I was headed towards Ghana rather than back here, he stamped me out and I was free to cross. At this point, I noticed that the taxi I’d been was no longer there. Assuming that both he and the other passenger had breezed through the border and would be waiting for me elsewhere, I headed out. Since I’d said that I was happy to go all the way to Lome with him, when I’d got out the car I’d left all my stuff in it; I had made a mental note of the car but of course memory isn’t the most reliable of things in quick moments. The border itself was marked by a gate and a chain across the road. I admit to performing a dainty little hop over the chain, probably a little more camp than I may have anticipated, and landed next to one of the many officials in the area who just wanted to check my passport. He did so, looked serious, and wandered off with it back over the chain. It appears that the border guards who had stamped me out had used the wrong stamp, and had actually stamped me in. A quick check, and the application of a pen to write ‘sortee’ over the word ‘entrée’, and everything was fine. Still no sign of the taxi, only border guards and quite a number of roadside vendors, trying to sell me belts, phone cards, and tissues, although I’d been discovering over the previous few weeks that this was all standard for transport hubs in West Africa. I edged towards the Togo frontier post – a badly-signposted pedestrian filter through a small building that, had it had a turnstile, wouldn’t have looked out of place at the entrance to a non-league football ground in the UK. There was a queue to get through, and a number of people were pushing through, desperate to get across quickly. This was nothing more than the actual frontier, staffed by two guards who were checking passports/ID cards, and interestingly, receiving rather more money than should have been the case. Although I didn’t make the definitive link, it did seem rather as though people were either showing passports, or slipping the guards some money. I said I needed a visa, and they directed me to the right. Just past these border guards was a pathway signposted ‘visas’, that led to a small building off the road, easy to miss, with four or five desks and French football on the TV in the background. Again the same questions to fill in on the forms; who I was, what my parents’ names were (no-one’s ever questioned that they both have different surnames to me), what my job is (everyone’s questioned that one – I have no idea what the French is for ’Insight Analyst’ and even if I did I’d probably still have to explain it) – but the actual process itself was very simple and, as an EU citizen, fairly cheap at 10,000 CFA – the sheets stuck to the walls suggested that many African nationalities had to pay 25,000. I was now in Togo. Unfortunately I had no idea if my taxi was; whether he was waiting for me in no-man’s land, or even still on the Beninese side of the border. Behind the final frontier was what amounted to a small waiting area for cars, but my taxi wasn’t waiting there. I wasn’t unduly worried, mainly because I hadn’t paid him yet – such things have served me well before; I lost my tuk-tuk driver after visiting the Killing Fields in Cambodia, but because I knew he’d want money from me, he’d find me before I found him; turns out we’d both gone to eat at the same café but missed each other by minutes. It was still frustrating though; I’d paid enough attention to the car to remember its colour and most of its registration plate, but of course memory plays tricks on you in high-pressure circumstances, and I couldn’t remember details like whether the registration was Beninoise or Togolese, nor what the driver looked like. After lurking around the Togo immigration barrier for a short while, I had a short conversation with one of the border guards, who suggested that taxis often waited further up the road; after clarifying the exact location, I jogged off up the road. I imagine I must have looked a particularly weird sight – a tall hairy white man running barefoot in the morning sun past stalls and motorbike taxis, clutching his chest pocket to ensure his passport didn’t fall out. Maybe they thought I’d escaped across the border illegally? Maybe they thought I was lost? At the taxi park, I was aided by a chap on a moto, who drove me around wondering f I could spot the taxi – but nothing. At this point I wasn’t sure the best thing to do; ought I stay around looking even more like a lemon, or contemplate heading off to Lome without my baggage, and speaking to the British consul, assuming there was even was one. I’d already, unusually for this trip, made a hotel booking so at least not having my guide book didn’t mean I would be completely stuck in Lome. Fortunately, the moto driver had got chatting to a few other people at the car park. They’d seen a white taxi pass earlier, with the driver saying he was looking for a specific white man. Having not found me, he’d headed off to continue his journey and drop off his other passenger. All I had to do was wait, and he’d be coming back. In the event I didn’t wait long – only a couple of minutes later, voices behind me shouted across the road, and my taxi drove by heading back towards the border. He turned round, and pi ked me up. It turns out that he’d waited for me, couldn’t see me, and driven along asking if anyone had seen me; we presumably hadn’t missed each other by much, or maybe we’d just been waiting in different places. Reunited with my bag and bottle of water, we drove away. This is the original, longer, and tbh inferior, version of a 300-word vignette I provided for the ‘story page’ collated by the nice folks at Hostelgeeks. And, if I’ve put you off adventures on The Road Less Travelled, they have a nice guide to Madrid you might be interested in instead!